This quick & easy pan-seared salmon recipe makes a restaurant quality dinner! 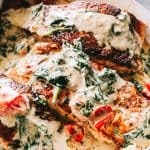 Flaky salmon smothered in a flavorful cream-less creamy sauce prepared with evaporated milk, tomatoes, and baby spinach. 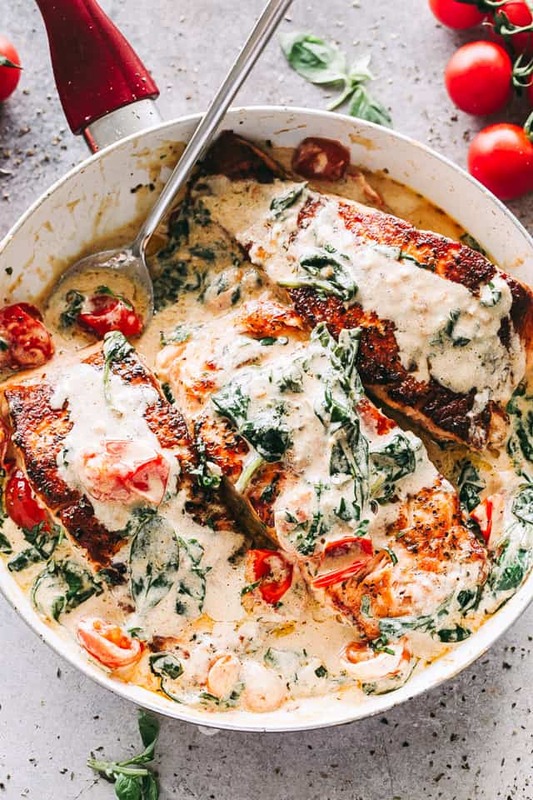 Creamy Pan Seared Salmon with Tomatoes and Spinach is a rich and filling meal, perfect for a quick dinner cooked in just one pan and in under 30 minutes! It is one of the easiest and tastiest, restaurant-quality dinners you will ever make. Salmon… is the reason why I can eat the recommended amount of fish week after week. This fish is an easy way to get more heart-healthy Omega-3 fatty acids into your diet. It’s especially easier when I can prepare it all in just one skillet. Crispy on the outside and tender on the inside, just the way we like it. Bonus? The creamless creamy sauce!! 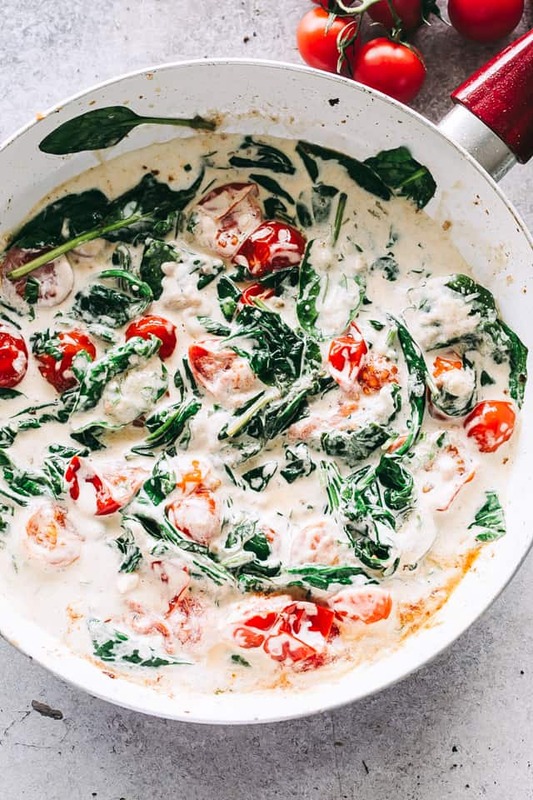 The amazing sauce of tomatoes, spinach, and evaporated milk adds a flavor that is beyond any other! You have to try it to believe it. WHAT IS PAN SEARED SALMON? 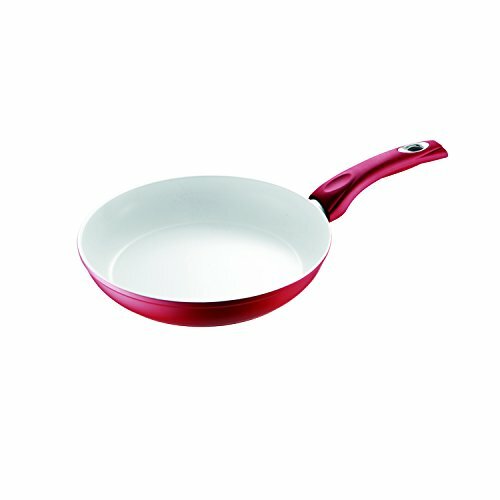 Pan searing, or sautéing, is a quick way to cook fish, or any other meat and/or chicken. For instance, my Pan Seared Sirloin Steak with Mushroom Sauce – yowza! 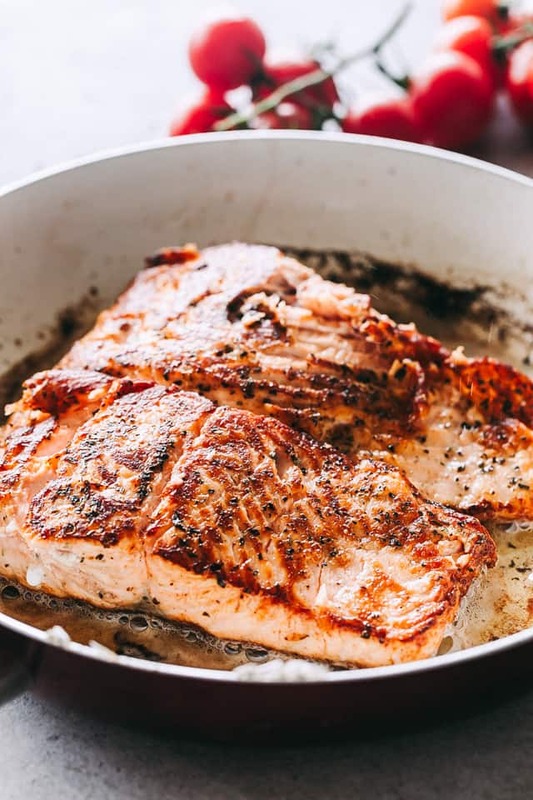 HOW DO YOU COOK SALMON IN A SKILLET? For skillet cooked fish, it is recommended to buy skin-on fish fillets. To start, you need to season the fillets with salt and pepper, and place the fish skin side up in a pan with garlicky olive oil. 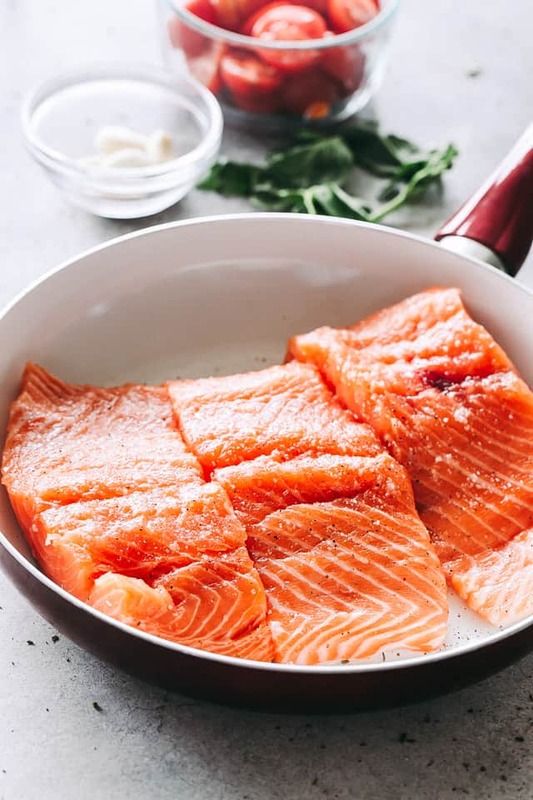 The salmon fillets will need to cook for about 7 to 8 minutes, depending on the thickness, but should not be moved around until they are cooked about three quarters of the way through. Flip, and continue to cook for 3 more minutes; remove from skillet and set aside. Wipe down the skillet, melt some butter, and add cherry tomatoes to the skillet; cook for a few minutes before adding in the spinach. Once spinach has wilted, you will stir in the evaporated milk, some grated parmesan cheese, and herbs. Place salmon fillets back in the skillet and let cook for about 3 minutes, or until everything is heated through. Ain’t that a pan of green and red beauty!? It’s just SO GOOD, you’ll want to smother everything with it! 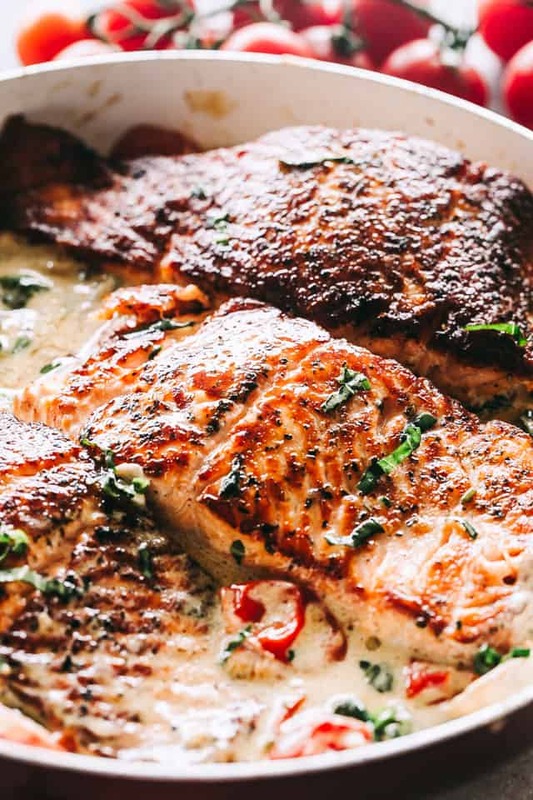 This is a great throw-together pan seared salmon recipe fit for a queen! It’s a super easy and so, so flavorful meal to make during the week, but also good enough to serve at your next fancy dinner party. Season salmon fillets with salt and pepper and transfer to the skillet, skin-side up. Cook for about 7 to 8 minutes, or until browned and cooked about three quarters of the way through. Flip over and cook for 2 more minutes more; remove from skillet and set aside. Add cherry tomatoes and season with salt and pepper. Continue to cook for 1 to 2 minutes, or until tomatoes begin to soften. Stir in spinach and cook for 1 minute, or until spinach is beginning to wilt. Stir in evaporated milk, parmesan cheese, basil, and parsley; bring to a simmer. Reduce heat to low and cook for 2 minutes. Add salmon back to skillet and continue to cook for 3 minutes, or until salmon is heated through. Spoon sauce over each fillet and serve. Made this tonight with 1/2 and 1/2, and a tablespoon of cornstarch. Served with Uncle Ben’s wild rice, super good dinner. I have done this 3 times already and it’s amazing. I play around with the vegetables that I cook with it; the French cut green beans were a hit. Thank you for this recipe! This was a BIG HIT tonight! I used half and half, and increased it just a smidge because I think I added extra spinach. Otherwise I followed the recipe exactly. I made zucchini noodles to serve on the side. Very tasty with the sauce! My friend and I made this tonight and we loved it!! My only problem is when I put the ingredients into my MyFitnessPal it gave me the amount of 423 calories per serving and my protein and fat were higher than what you had. Not sure what I did wrong or if I bought different type of low fat evaporated milk and salmon than you. But still, it was delicious! I’m so happy you all enjoyed it! Thank you!! Regarding the nutritional info, I find that nutritional calculators will all show different results, unfortunately. They’re very inconsistent. I use the paid version for Weight Watchers because I assume theirs would be most accurate for the sake of their brand and what WW is about, but you just can’t be 100% sure. Delicious!! I substituted the evaporated milk with coconut milk and I squeezed fresh lemon on top just before serving. I served the salmon with cauliflower rice and asparagus. Yuuuuuum I’m gonna try it that way! This was so, so good. We are filing this away for later. It was super quick and would be perfect to serve company when they come over! I can’t wait to make this tonight! What would you suggest as a good side dish with this recipe? Would some angel hair pasta work? 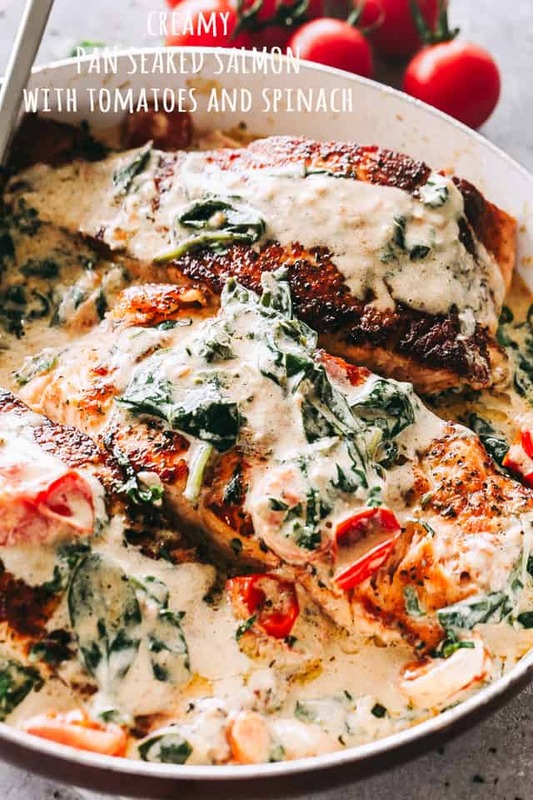 I would love to be the queen eating this creamy salmon! It sounds so luxurious, but I love love love that it’s only 30 minutes of cooking! Definitely giving this recipe a whirl. I am making this tonight! Anything with the word “creamy” in it…I am excited! It looks so creamy delicious! Such a great way to cook salmon! Served this for the first time tonight. It looked beautiful and tasted wonderful!!! The only addition my other half suggested was some nice rolls or bread to go with it — and to dip into the leftover sauce. We watch calories and sodium, so it was great to have the breakdown to go with the recipe. Living in Alaska, I have a freezer full of wild caught salmon! I can’t wait to give this recipe a go. It looks delicious! I love salmon! This is such a great way to change up our normal routine of serving it. Oh my gosh, that cream sauce is Ah-mazing!! Yum!! I am a little confused about instruction steps 5 and 6? Now that I see it, I am also confused! haha 😀 I guess I felt like I needed to say the same thing twice, but in different words. 😉 I’ll fix it right away. Thank YOU for letting me know! 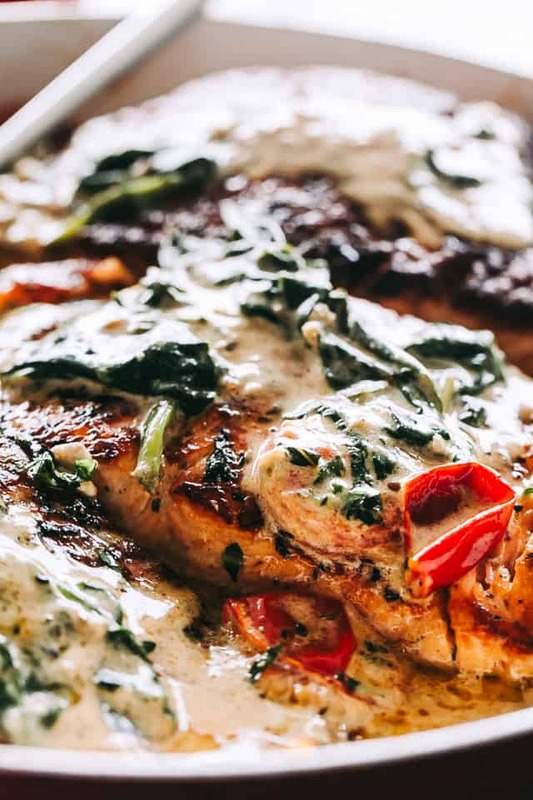 This cream sauce looks seriously AMAZING!!!! Everything about this dish looks delicious, but that sauce is just heavenly!! Yummmmmm!